1. 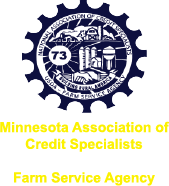 For Friday and Saturday including the Friday evening banquet, access the paper form here, complete and send to Darlene Johnson, McLeod County FSA Office, 1103 Gruenhagen Drive, Glencoe, MN 55336 with your check made payable to MNASCOE. 2. For Friday attendance at the MACS meeting only you may complete the electronic registration here. THIS DOES NOT INCLUDE THE FRIDAY NIGHT BANQUET. For MACS attendees MACS will cover the $5.00 registration charge. To expand, improve, and expedite the services of USDA Agencies to Rural America.